Pallets have really become pretty popular in the diy project area. 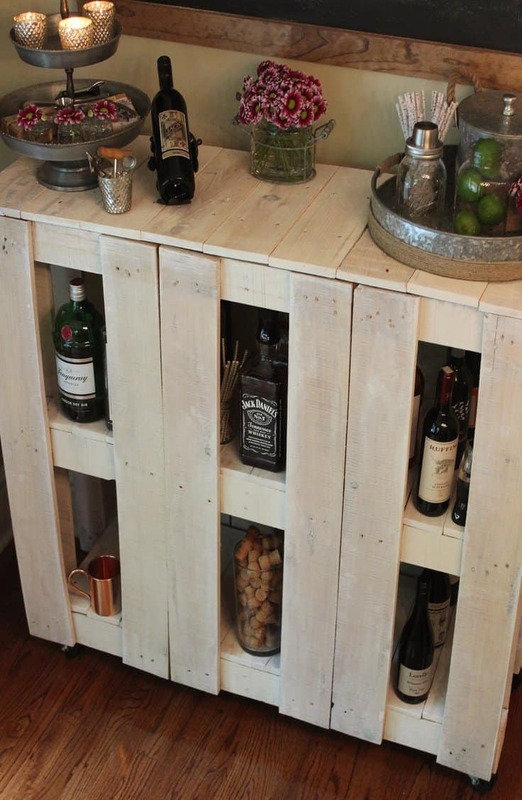 You can take a basic wooden pallet and transform it into a bar that will totally transform your space. I have a wide assortment of epic palet bar ideas below to really help give your home a unique feel and make your pallet bar be the center of attention. 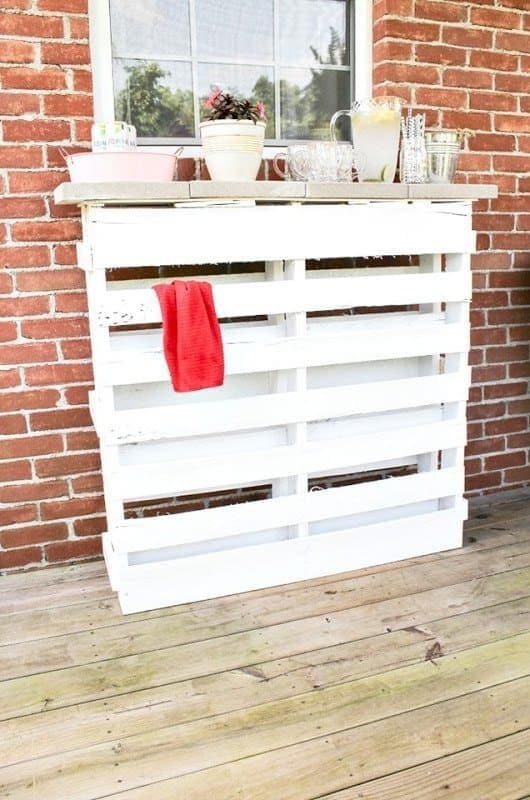 Nicki at HomeTalk created this pallet to have next to the grill for a prep area, and decor piece! 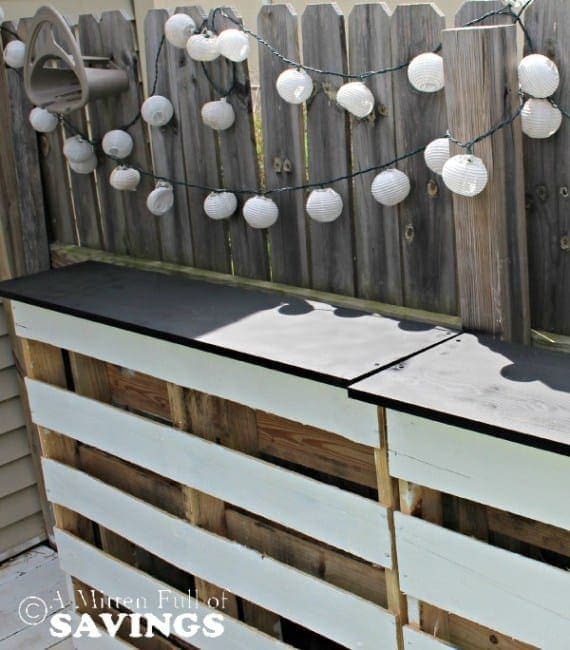 It is a perfect simple and clean pallet bar to make for your back deck. This is a good size if you have a small area to work with, and you can paint it any color to really add color or make it stand out. Perfect for weekend entertaining. Click here for a tutorial on how to make this bar. 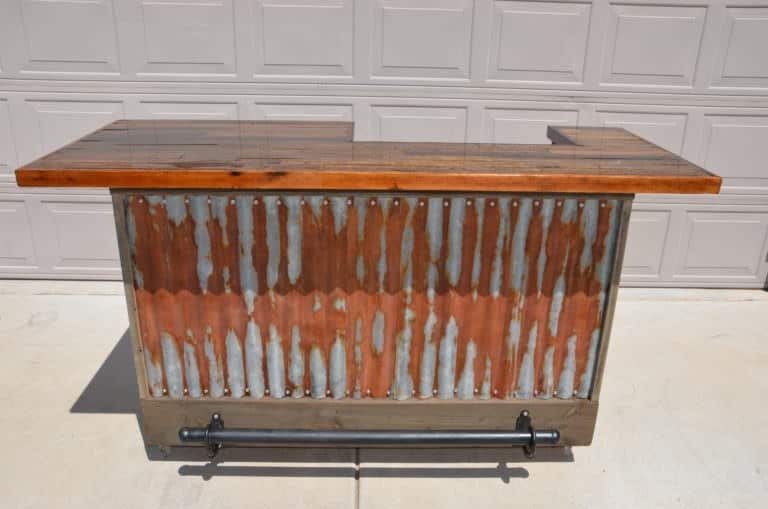 My Repurosed Life wanted a pallet bar that they could take anywhere they wanted to entertain, so they created this portable style bar. What makes this bar so unique, is you can fold it up and move it easily. Say you want to entertain but want the bar moved, you can easily do it. It isn’t bulky and heavy and has to be stuck in one area. 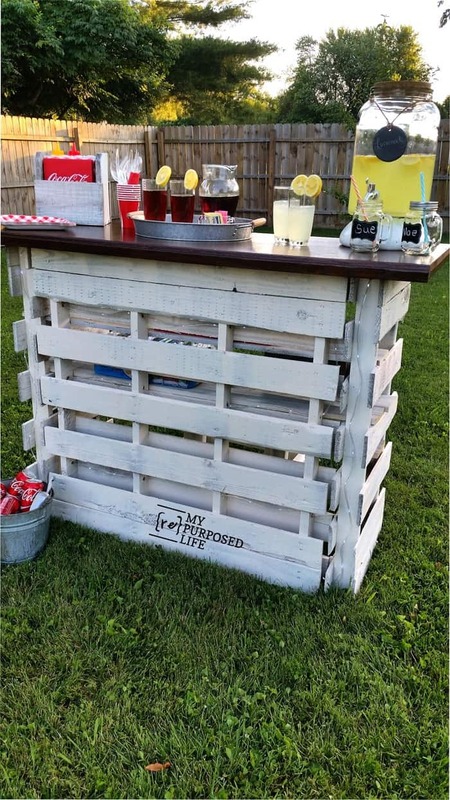 See how to make this portable pallet bar here. Daniel at 101 Pallet Ideas, wanted to create a bar that was ready for the warmer months of the year for entertaining. He whipped this bar up in no time flat. This bar is very simple but stunning at all the same time. I love the different colors they used to really make this have a rustic feel to it. Make this and have it ready for your spring and summer entertaining with family and friends. Go here to see step-by-step instructions. A Worthy Read wanted to add one more piece to their backyard oasis, and they decided to create this pallet bar. They were so happy with the turnout. This is a really unique look that can transform your outdoor space. With some long pieces of wood added to create a nice table top, this painted patio bar is the talk of the party. Here is how it is made! DIY Joy wanted to create something unique, and they went with a concrete top to add a new dimension to this bar, it turned out perfect.The concrete patio pavers on top really give this bar a unique flare. Add whatever stain or paint color you want, put your pavers on, and you have a bar ready in an afternoon. See how to make this stunning piece. Over at Instructables, she wanted to surprise her boyfriend for Father’s Day and I think she did just that. If you are on the hunt for a larger style bar for outdoors, you might check out this tutorial. They used Italian tiles for the topper and it turned out really spectacular. 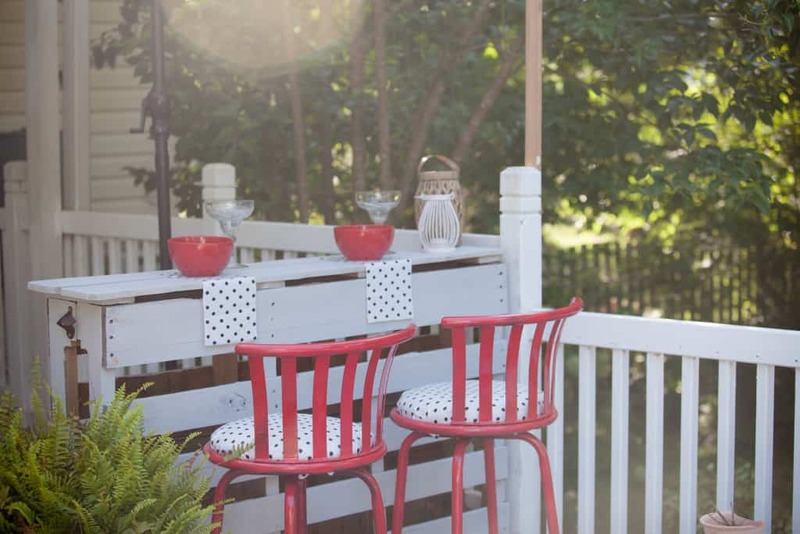 A great place to serve drinks and have a place to lean on and chat with your friends at your next barbeque. Check out the diy tutorial here. 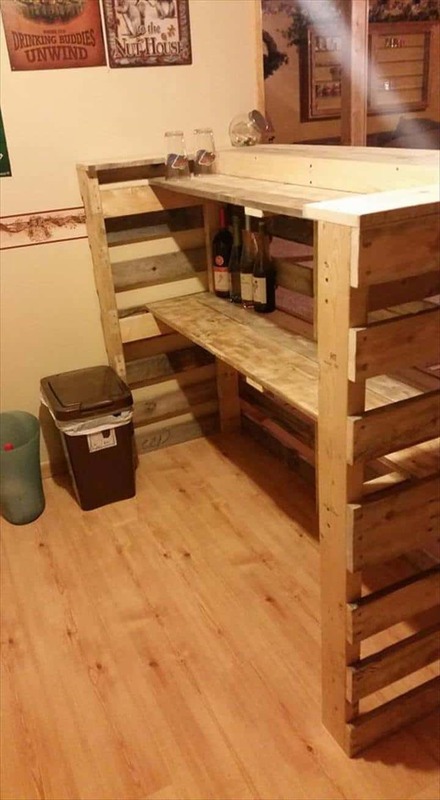 Rebecca from Infarrantly Creative made this amazing pallet bar for $135, and look at the transformation it did. 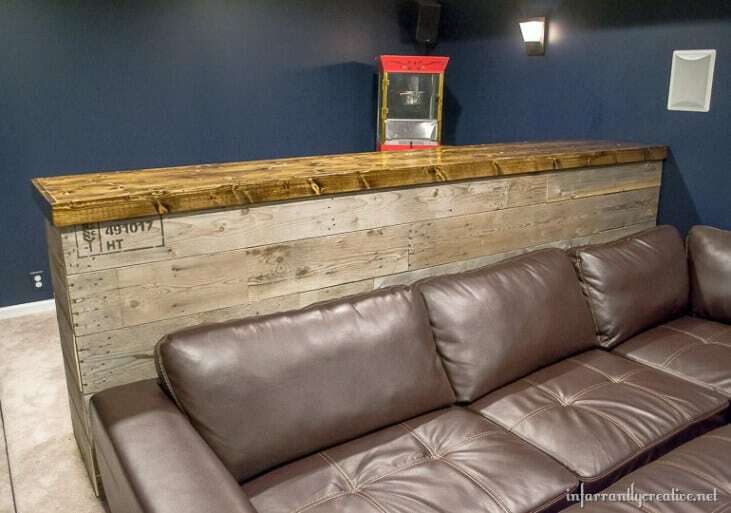 Dress up the man cave with this rustic style wood pallet bar. 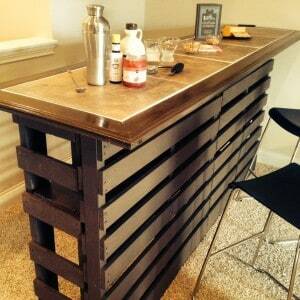 The two tones of stain used really help make this pallet bar stand out. Full tutorial here. Ametuer Hour at Instructables built this for a friend who was on the hunt for a diy pallet bar. Embrace the natural marks of the wood in your pallets with this easy bar. You can make this in an afternoon pretty easily. This bar does have a cement top, they show easily how to lay a concrete topper for your bar. Learn how to make this style bar here. 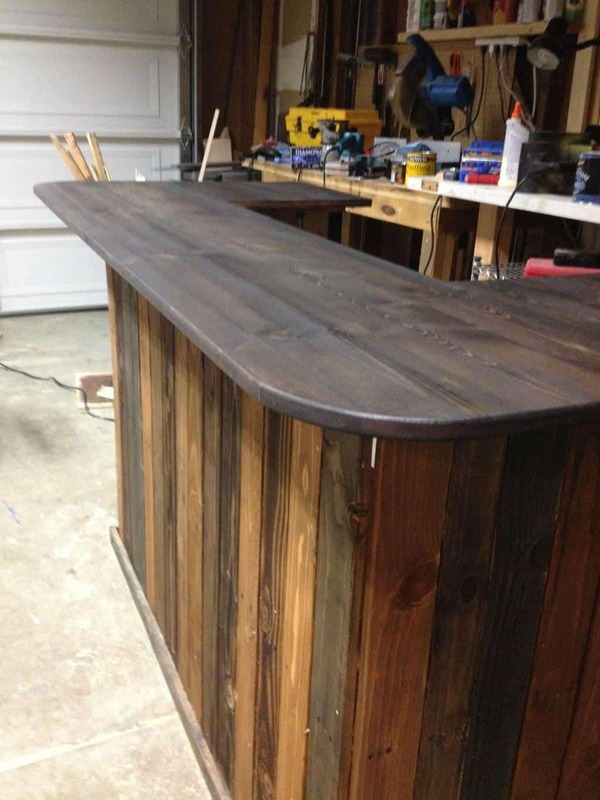 Imgur shares how to make this stunning bar, he wanted to add burn marks to add more definition to the wood. This is a very creative idea on how they made this bar, with a great step-by-step tutorial. They used a torch to add some color, and then used a handful of stains to really add a variety of colors. Follow this step-by-step guide to make your own. How I play at Randy Elrod had never built anything before, and they worked hard and created a perfect bar. After pricing what a bar would cost, they thought it would be easy enough to tackle a diy and create a fun indoor pallet bar. This cost only $140, and really turned out exquisite. Head here to see how they made this stunning bar. 99 Pallets wanted a budget friendly bar that was made with sturdy wood, so they reached for pallets. The beauty of this pallet bar is it has nice spaces between the wood that really offer a unique look. You can customize this bar to fit any size you need for your space. A nice shelf to store liquor, snacks, and more. Check out how they made it here. Holly from My Pinteresting Life, created a unique and creative pallet bar that fit her space. This is a unique twist to a pallet bar, it is a cart so you can move it if you want. With it having wheels on the bottom it is perfect for entertaining and moving from room to room. Tutorial here. Discarded Development put this bar together with his girlfirend and they couldn’t be happier with the end results. This is a bit more complex work needed, but the outcome is really exquisite.You get an awesome chevron print design, and the multi-colors helps this bar stand out. 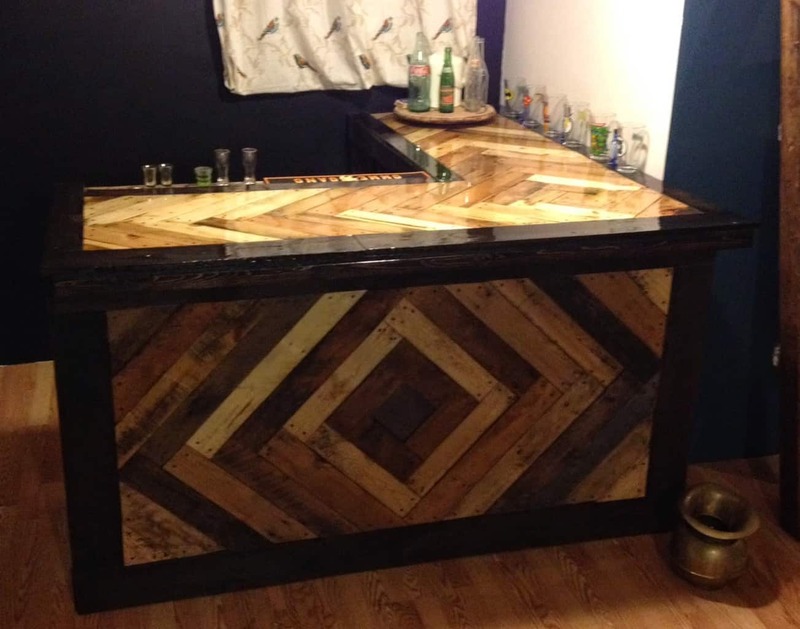 With a little work, you can create a custom chevron designed bar in no time. Full tutorial here. 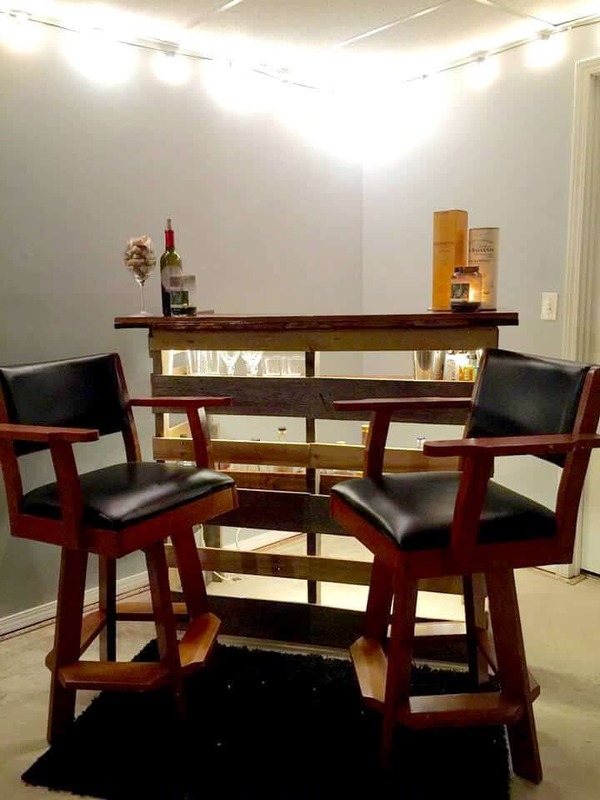 Jerry from 1001 Pallets said it was a process to create this bar, but in the end it was beyond worth it. 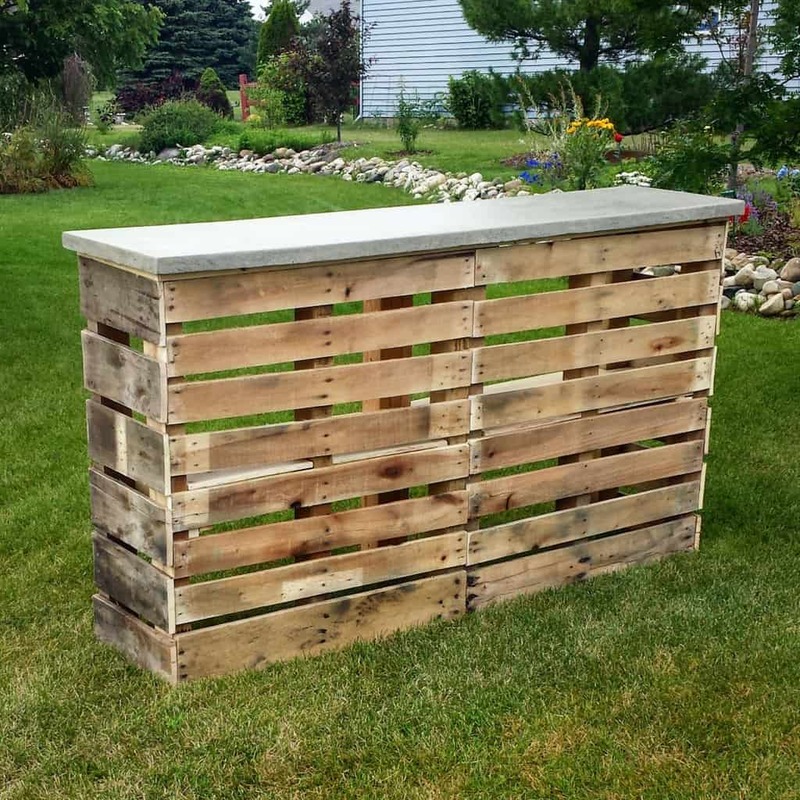 This pallet bar is definitely a show stopper when people see it. It offers a rustic country feel. It has a high resin top that shines, and then a front that has a rusty metal that really adds so much personality. Looking to make one, see how they did it here. 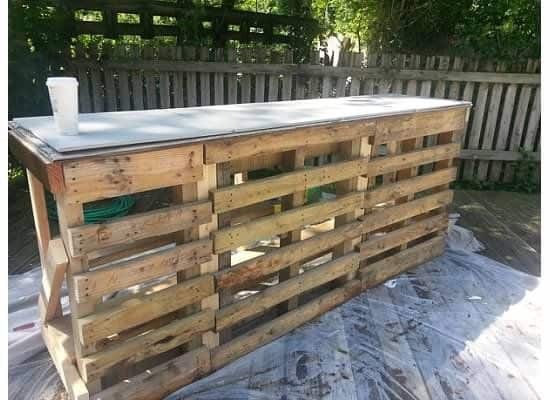 Amber from Amber Tysl was on the hunt for a good pallet diy, and she decided on this bar to change up the space in her backyard. 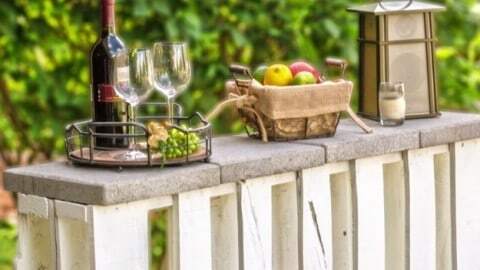 A pallet bar that can be built into your deck, great to add a new dimension to your deck. I love the color choice they used and the bottle opener on the side is genius. This is a very easy tutorial on how they created this awesome bar. I hope these give you inspiration or direction on the type of pallet bar you might want to build. By making your own pallet bar you can save a lot of money, and it is a great way to pass the time!